Proposed 2M-square-foot Silvercup West complex in Long Island City, near the Queensboro Bridge. Used with permission of The Marino Organization. All rights reserved. 2M-square-foot complex with apartments, office, commercial and production studio space sent to Council. Silvercup Studios, through Terra Cotta LLC, obtained Planning Commission approval for several rezoning and special permit applications to enable the development of Silvercup West, a 2.07-millionsquare- foot complex that would occupy six acres along the East River waterfront in Hunter’s Point, Queens. The site, bordered by Vernon Boulevard, the East River and 43rd Avenue, lies partially under the Queensboro Bridge and contains a temporary generating facility run by the New York Power Authority, which would end operations if the project obtains approval. Silvercup Studios is the largest full-service film and television production facility in the northeastern United States. It currently operates locations in Hunter’s Point and Blissville, Queens and its expansion into Silvercup West would be its third Queens location. The complex would consist of one large base building that would separate into four towers: a film and television production studio tower would rise to 133 feet in height; two residential towers would reach heights of 589 and 506 feet; and an office tower would have a maximum height of 526 feet. In total, the complex would include over 270,000 sq.ft. of film and television production studios, 589,590 sq.ft. of office space, 1,000 residential units, 106,014 sq.ft. of community facility space, restaurants, bars, and a 1,400-space parking garage for complex tenants. Additionally, the project includes 55,000 sq.ft. of public open space, including a walkway along the East River. The development required eight linked text and map amendments, special permits and a certification. Silvercup proposed creation of a new mixed-use district (an MX- 9) that would allow residential, commercial, community facility and manufacturing uses as of right to replace the site’s existing manufacturing zone (M1-4). The design required special permits to modify setbacks, building heights and residential floor plates, and a special permit for the garage. A proposed 9,745-square-foot neon red sign necessitated an additional text amendment and special permit. hearing, Stuart Match Suna and Alan Suna of Silvercup Studios testified to the pressing need for additional studio space. Among the 25 speakers who testified in favor, members of Queens Community Board 2 and the Director’s Guild of America emphasized the project’s economic development benefits, including a projected 3,900 jobs. They also focused their testimony on the waterfront access and increased green space, and requested that an affordable housing component be included in the proposal. Habitat for Humanity, Asian Americans for Equality and members of Community Board 2 testified in opposition and asked that ten percent of the 1,000 residential units be reserved for affordable housing. 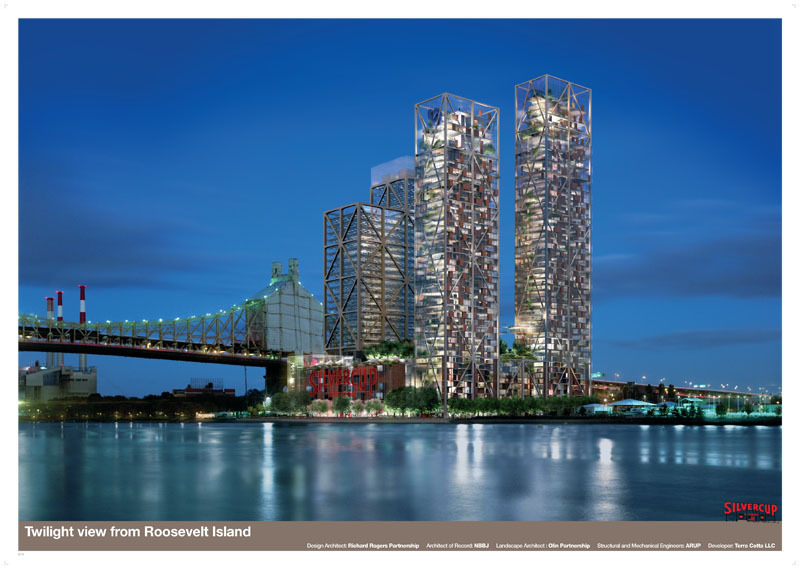 Additional members of Community Board 2 also argued that the development would block views of the Queensboro Bridge as well as light, air, and waterfront views. When asked by Commissioner Angela Battaglia about an affordable housing component, Alan Suna responded that the project was primarily an economic development effort, not a housing project. Following the hearing, however, Silvercup modified the proposal to include 150 affordable housing units within one-half mile of the project site. The Commission approved on July 12, 2006, stating that the project, designed by Richard Rogers, would “establish an essential iconic presence” along the East River waterfront. Although the proposed new district would allow greater floor area, Silvercup agreed to a restrictive declaration, limiting the development to a 7.9 FAR. Chair Amanda M. Burden called the project “one of the most important private applications to come before the Commission,” and Commissioner Irwin Cantor called the architecture “extraordinary.” The Commission recognized that the project was primarily an economic development project, noting the importance of the film industry to the city’s economy, but praised Silvercup for adding the affordable housing component.